Collaboration Areas are a place-based, multi-stakeholder approach to solving complex urban issues. Collaboration Areas deliver coordinated planning in locations that have great potential to grow their vibrancy, diversity and productivity, with improved employment and education opportunities, enhanced liveability and sustainability. They are led by the Commission over a 12-month period and support councils, state agencies and stakeholders to address major issues and achieve better outcomes for an area. The Commission has identified Collaboration Areas because of their potential to grow into centres of increased productivity and innovation, attracting knowledge intensive jobs, creative industries, leading researchers, and unique places for people. bringing together multiple and diverse stakeholders to find practical solutions that are based on efficient, effective and coordinated planning and investment. Where are the Collaboration Areas? Who is involved in the Collaboration Areas? Each Collaboration Area involves a diverse range of stakeholders, relevant to the specific place and the challenges to be resolved. A Stakeholder Group, chaired by the relevant District Commissioner, typically includes the local council, key agencies such as Transport for NSW, Health Infrastructure, the Local Health District, Department of Education and tertiary education institutions. What are the outcomes of the Collaboration Area process? The Commission works with each Collaboration Area Stakeholder Group to produce a Place Strategy. This sets out a shared vision for the area, identifies impediments and opportunities, agrees on priorities and identifies projects and initiatives to deliver the vision. These elements are developed and agreed by Stakeholder Group members and build on consultations and studies previously completed by individual Group members. The Place Strategies are reported to the Greater Sydney Commission’s Infrastructure Delivery Committee for endorsement and then the Commission’s Board, for approval. The Place Strategies will be included in future updates of the District Plans. The Place Strategies will be implemented collaboratively by councils, state agencies, universities and other stakeholders. Vision – By 2036, Liverpool is a rejuvenated river city, offering diverse and growing residential and employment opportunities. Major health, education and retail precincts, and a network of open spaces and parklands alongside the Georges River, create a rich mix of jobs and workplaces, public spaces, shops and entertainment. 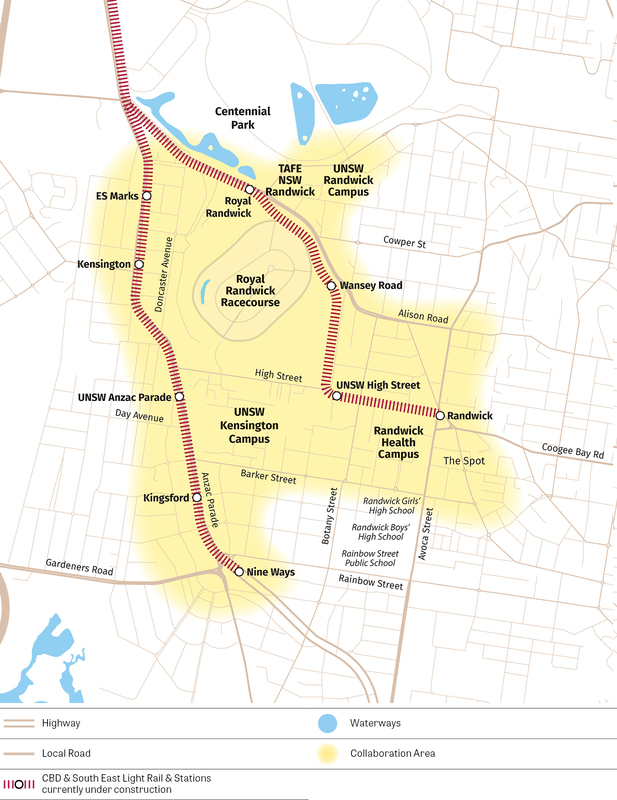 The Liverpool Collaboration Area, one of three in the Western Parkland City, includes Liverpool’s City Centre, the health and education precinct, the Warwick Farm precinct, and nearby residential and industrial lands. As Liverpool grows, transforming the CBD and surrounds with new jobs, infrastructure, sustainable places and a mix of dwellings, requires a coordinated effort from multiple and diverse stakeholders. The Liverpool Collaboration Area Stakeholder Group was chaired by the Commission’s Environment Commissioner and included representatives from Liverpool City Council, state government agencies covering health, education, environment, planning, transport and emergency services and the Liverpool Innovation Precinct, which includes Liverpool Hospital, NSW TAFE, Western Sydney University, and the University of Wollongong. 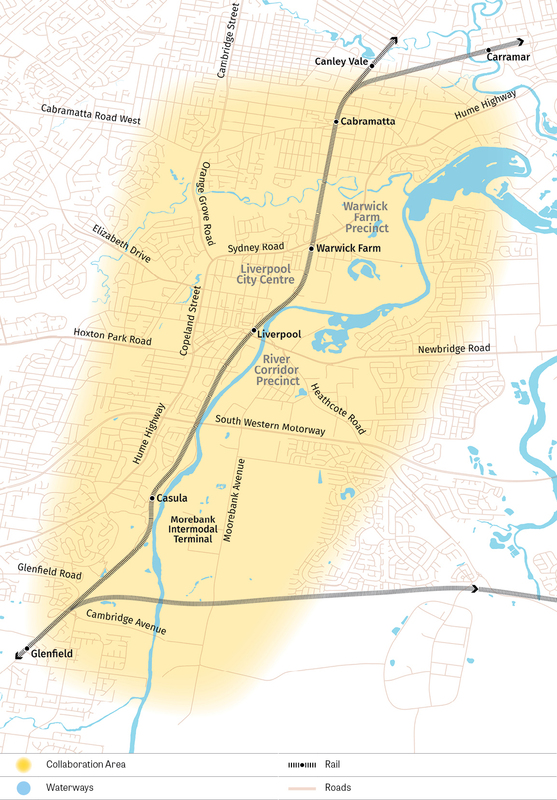 Vision – In 2036, Greater Penrith is a key metropolitan centre in the Western Parkland City and the principal gateway to Greater Sydney for western NSW, offering sustainable, diverse and growing residential, employment and tourism opportunities. Greater Penrith is an important centre in the Western Parkland City, rich in natural assets, adventure tourism facilities, retail and commercial services, and home to a growing health and education precinct. The area sits on the doorstep of the Greater Blue Mountains World Heritage Area, Greater Sydney, the Nepean River, Penrith Lakes and the emerging international airport and Aerotropolis. 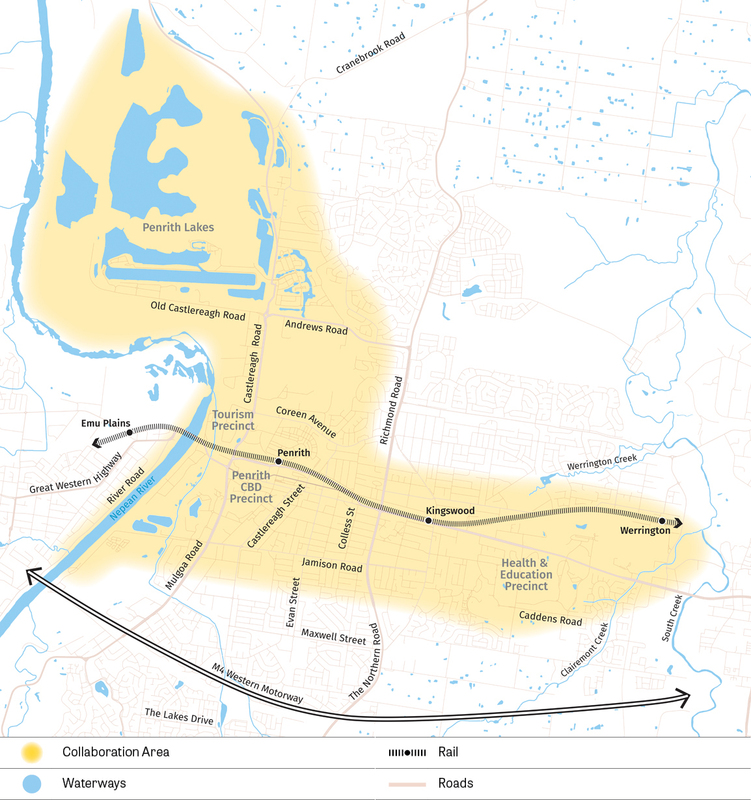 The Greater Penrith Collaboration Area covers the Penrith Central Business District, the health and education precinct, and the tourism precinct from Penrith Lakes along the current length of the Great River Walk to the M4 Motorway. The Greater Penrith Collaboration Area Stakeholder Group was chaired by the Commission’s Social Commissioner, and included representatives from Penrith City Council, state government agencies covering health, education, environment, planning, transport and emergency services, and The Quarter Penrith health and education precinct which includes NSW TAFE, The University of Sydney, Western Sydney University and Nepean Blue Mountains Local Health District. Vision – In 2036, Camperdown-Ultimo Collaboration Area is Australia’s innovation and technology capital. Industry, business, health, education and skills institutions work together, and talent, creativity, research and partnerships thrive. Low carbon living, green spaces, places for people and easy connections support resilience, amenity, vitality and growth. The Camperdown-Ultimo Collaboration Area, located in the Eastern Harbour City, is one of the largest and most comprehensive health and education precincts in Greater Sydney. The area includes the Royal Prince Alfred Hospital, TAFE NSW, University of Notre Dame, University of Sydney and University of Technology Sydney, and medical and research institutions. A unique range of specialisations in the area presents great potential for the area’s continuing maturity as an innovation district. The key priority of this Collaboration Area is to support the area’s vitality and economic growth. The Camperdown-Ultimo Collaboration Area Stakeholder Group was chaired by the Commission’s Eastern City District Commissioner and included representatives from City of Sydney, Inner West Council, Sydney Business Chamber, Carriageworks, the University of Sydney, University of Technology Sydney, University of Notre Dame, TAFE NSW and state government agencies covering health, education, planning, environment, transport, finance and innovation. Vision – By 2036, Randwick has matured into an innovation district of engaging places, with a highly integrated university and health campus. Town centres, residential, employment, recreation and community areas are interconnected, allowing people to move, interact and share knowledge and ideas. The Randwick health and education precinct is one of three Collaboration Areas in the Eastern Harbour City. It is strategically located between the Sydney Central Business District and Sydney Airport. It contains the University of NSW Kensington Campus, Prince of Wales public and private hospitals, the Royal Hospital for Women, Sydney Children’s Hospital and numerous research institutions. The Randwick Collaboration Area Stakeholder Group was chaired by the Commission’s Eastern City District Commissioner and included representatives from Randwick City Council, University of New South Wales and state government agencies covering health, education, planning, environment, transport and housing. A key priority is to improve the integration of health, research, education and teaching to drive innovation and economic growth across the area. The Rhodes East Collaboration Area complements the Rhodes East Planned Precinct being run by the NSW Department of Planning and Environment with City of Canada Bay Council. This Collaboration Area is in the Eastern Harbour City and includes land on the eastern side of the rail line, within walking distance of Rhodes train station. The focus of the Rhodes East Collaboration Area is to investigate how sustainable utility infrastructure can be delivered across the Precinct. This includes low carbon/ high efficiency energy supply and recycled water. 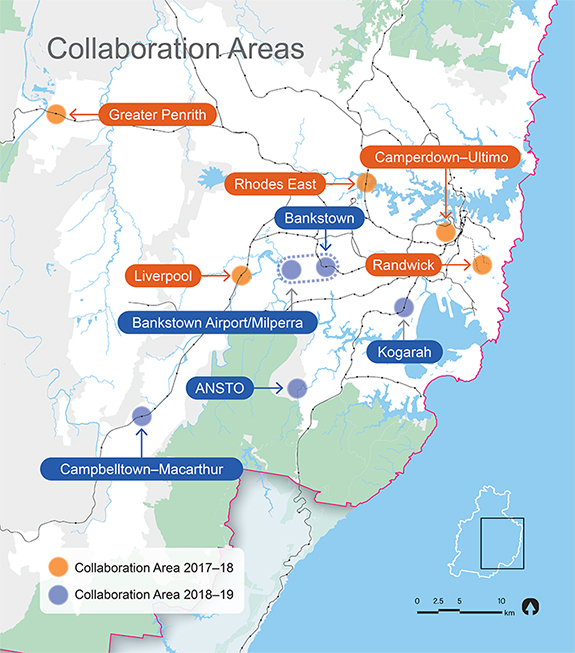 The Rhodes East Collaboration Area Stakeholder Group is chaired by the Commission’s Eastern City District Commissioner and includes representatives from City of Canada Bay Council, Sydney Water, Sydney Olympic Park Authority and the NSW Department of Planning and Environment. The Rhodes East Collaboration Area Stakeholder Group has identified two key issues preventing the delivery of sustainable utilities in the Rhodes East Collaboration Area. These are the limitations of the planning framework in requiring strata schemes to connect to recycled water, and capacity constraints with the current water recycling plant at Sydney Olympic Park. The Commission is facilitating discussion between stakeholders about how these issues might be resolved and is working with the Collaboration Area Stakeholder Group to investigate how existing regulatory frameworks can be used to encourage the uptake of sustainable utilities. $740m Liverpool Health and Academic Precinct. Due for completion by 2026, the redevelopment will include a new comprehensive and integrated cancer centre, an expanded emergency department, and enhanced neonatal intensive care, maternity and critical care. This investment is a catalyst for the development of a health, education and research precinct which is core the Collaboration Areas vision for Liverpool. It will enhance Liverpool Hospital’s credentials as a hub for new and innovative technologies and health services. The Liverpool Innovation Precinct was established to bring together key stakeholders from across government, education, and business sectors in a collaborative effort to deliver an aspirational vision for the Precinct, with a focus on developing the area as a growth precinct focusing on Health, Education and Research sectors. Its formation provided a unified voice on key issues for input to the Collaboration Area process. The ‘Reimagining… the Liverpool Health, Education, Research and Innovation Precinct’ was launched by Lucy Turnbull AO, Chief Commissioner, Greater Sydney Commission in August 2017. Anchored around the Liverpool Hospital, the Precinct will attract the industries and jobs that will drive the next wave of economic progress in the region. The NSW Government has committed at least $450 million for Stage 2 of the Nepean Hospital redevelopment which boosts the total budget to over $1 billion for a new hospital, community-based health facilities and a multi-storey car park. The Nepean Hospital forms a significant part of the Penrith Collaboration Area. This investment is a catalyst in the development of a mature health and education precinct in Penrith. The Quarter is a governance group established by key stakeholders in Penrith. It has been formed to coordinate and promote Penrith as an international destination for investment and excellence in health care, medical research, world-class education and related technology. The Quarter has been recognised as part of the Penrith Collaboration Area by the Greater Sydney Commission. This is the first step in the renewal of Central Station, creating a new pedestrian gateway to the east and better linking the suburban rail network. The walkway will be a 19-metre wide underground concourse from Chalmers Street, connecting customers to suburban rail platforms, Sydney Metro platforms, the new light rail and buses. This improvement in connectivity for a range of transport modes will enhance the Collaboration Areas accessibility and permeability. The GSC Collaboration Area raised the profile of Camperdown/Ultimo as an innovation district, its significance as an economic cluster and job creation potential. 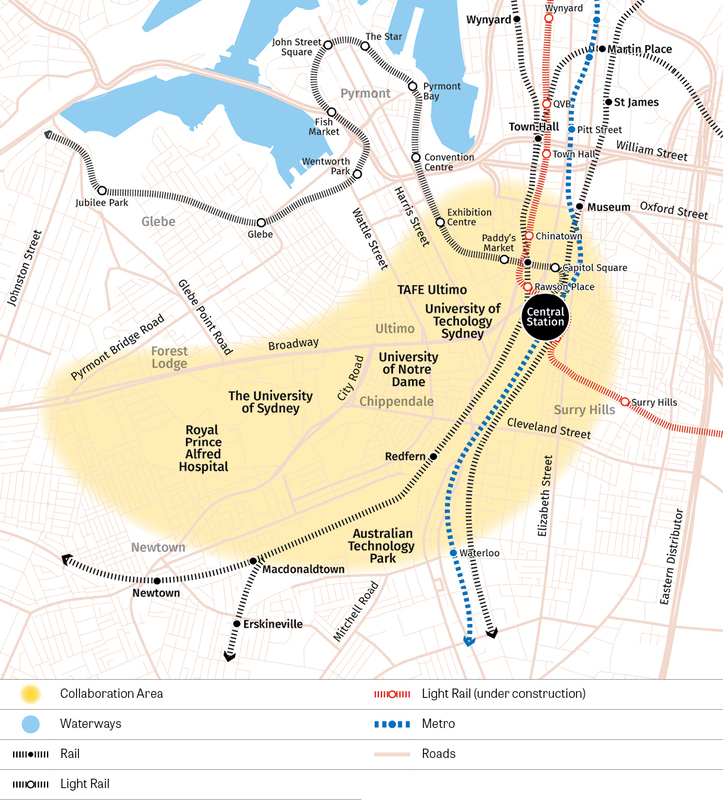 The NSW Government formed a taskforce, headed by Jobs for NSW chair David Thodey, to lead design and development of the new technology and innovation precinct, stretching from Central to Eveleigh. UPDATE: It has been announced that Australian IT company, Atlassian, has reached in-principle agreement to become the anchor tenant of the Sydney Innovation and Technology Precinct at Central-Eveleigh. The NSW Government is investing $720m to deliver a new Acute Services Building for Prince of Wales Hospital. The first stage is a catalyst project that will contribute significantly towards delivery of the Collaboration Area vision of building a world-class health, research and education precinct delivering cutting-edge, compassionate and holistic healthcare and wellness programs to the local community and other residents of NSW. Transport for NSW, working with key State and Local Government stakeholders has commenced a multimodal transport strategy that will implement Future Transport 2056 for South East Sydney. This includes the Randwick Collaboration area. The strategy will define a long term transport vision and identify transport services, policy and infrastructure to serve future demand. The transport strategy is a priority recommendation in the Collaboration Area Place Strategy. The NSW Government has announced a partnership that will see UNSW Sydney make an initial investment of up to $250 million in a Health Translation Hub on the Randwick Hospitals Campus. Bringing together clinicians, researchers, educators and public health the hub will drive excellence and the rapid translation of research, innovation and education into patient care at Randwick. The Health Translation Hub will open in 2025 and is part of a broader $500 million commitment to the precinct by UNSW over the next decade. This investment complements the NSW Government’s $720 million investment to deliver a new Acute Services Building and is a major step towards achieving the vision for the Randwick Health and Education Precinct.